Getting the most from your marketing automation solution, like any software product, requires a commitment to understanding the technology and the dedication to implementing the processes and strategies necessary to make it work. Working with a variety of solutions (i.e. Pardot, Act-On, Marketo) in support of our clients, we’re in a unique position to offer this list of 10 marketing automation system setup and management tips to help you get the most from your investment. Marketing automation shouldn’t be treated like an e-mail tool. It’s a complete marketing platform that will help you build better processes for managing communications, qualifying prospects and follow-up on inquiries. This only works however if you understand how each of these things should work in the first place. When implementing a marketing automation solution, focus on building the right process for your business then use the tool to automate those processes as much as possible. When you first begin segmenting your database, your natural instinct is to start looking for prospects ready to be delivered to sales. To benefit from the economies of scale, made possible by marketing automation, a more effective approach is to start at the top of your funnel.Create campaigns that will help you identify meaningful groups within your total audience. Each new campaign should help you identify and further segment your database until you have a complete profile that meets your ultimate qualification criteria. When you create new content or evaluate your existing content, think about the characteristics of the prospect to whom that content that will appeal. For example, if someone downloads a product overview brochure, this prospect is probably near the top of sales funnel. If a prospect downloads a sample request-for-proposal worksheet, this prospect is presumably farther along in the buying process. Understanding and making different types of content available can help you profile prospects. Asking prospects for information you already know is a waste of their time and counterproductive to your lead generation efforts. Progressive profiling and prepopulated forms allow you to streamline and improve the user experience by eliminating this repetition. It also allows you to more quickly profile prospects. When you first start to use a marketing automation system, you’ll constantly be reviewing user activity. As the size of your database and number of campaigns increase, this becomes problematic. When that happens, it’s vital to create a lead scoring system and segmentation process to prioritize leads. Lead scoring, starts with rating the different types of content you have and giving each one a value. You can then segment prospects by score or by key activities that could represent active sales engagements. In this way, you’ll have better visibility to activity within your funnel. One of the hardest things to get used to when developing marketing automation programs is the need to develop campaigns in reverse. Because one action will trigger another action, you need to have each subsequent action built prior to finalizing the prior activity (i.e. you can’t send an e-mail in response to a form or page visit if an e-mail isn’t written and available for use) . A helpful tip is to white board an entire campaign before you begin creating elements within your marketing automation system. Once you’ve created a program, process or resource, don’t fail to reuse it in other campaigns. Good content and proven processes are critical to your long-term success. Incorporating these elements into other campaigns, either as callouts or sidebars, is a great way to leverage your content and keep your prospect engaged with your organization. Qualification is only one aspect of the lead generation process. Building in processes and criteria to filter out unqualified prospects such as job seekers, the competition, existing employees and spam artists is another important aspect of marketing automation solutions. Not only can this save you time and money, it is often easier to disqualify a prospect than it is to qualify them. Marketing automation solutions have done a great job creating easy-to-use templates for building web forms, landing pages and emails, but they can’t do everything. Often it is easier to create a landing page outside your tool and simply load it into the system. This can be particularly helpful when working with lots of images or dynamic media such as video and other content you want to present in different ways. Landing pages are built to generate responses from your target prospects. Creating landing pages that look exactly like your website and include all the links within your standard menu can be distracting to your prospects. Try to minimize these elements to the bare essentials and use the links you do provide to lead your prospects to a particular educational resource that can help you profile them better. 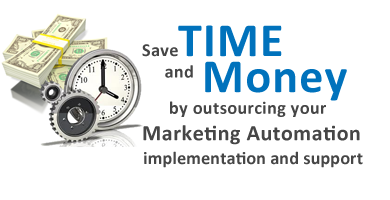 The Top 5 Reasons You Need a Marketing Automation Expert on Your Team? Are Your B2B Email Marketing Campaigns Underperforming? Here’s Why. Is Your B2B Online Marketing on Autopilot? Staying Relevant in Marketing: How Do your Skills Measure Up? © 2019 ResponsePoint All Rights Reserved.